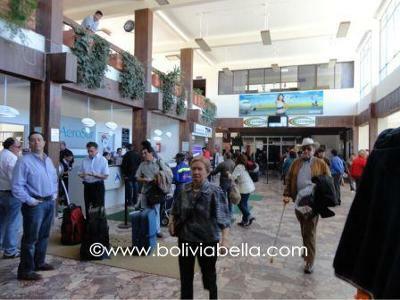 The Sucre Bolivia airport, known as the Juana Azurduy airport, is small, hardly befitting Sucre, the capital of Bolivia, which is growing very quickly. Still, it handles national flights every day of the week. One of the problems the Sucre airport has is fog. Sucre tends to get foggy and flight delays are frequent for this reason. Aside from that, it's a very nice airport and because of its size, it's very easy to find your way around. The airport has several national airline ticket counters, very little seating area for waiting passengers, restrooms, a café restaurant on the second floor, and a few shops, including Sucre's famous Para Ti chocolates and Taboada chocolates. It also has WIFI throughout. There is a travel agency, but there are no money exchange houses at the Sucre airport and none of the stores are willing to change dollars or foreign currencies. Therefore, if you have a flight through another city prior to arriving to Sucre, be sure to change your foreign currency for bolivianos so you'll have money to pay your taxi as taxis also do not usually have enough money to change dollars. A typical taxi fare from the airport to downtown is Bs. 25-30. 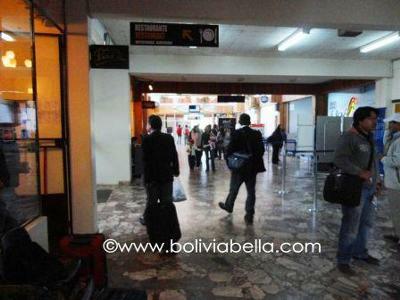 In May of 2011 Bolivia's president, Evo Morales, announced plans to build a new, more modern airport in Sucre. It will be located in the area of Alcantarí. 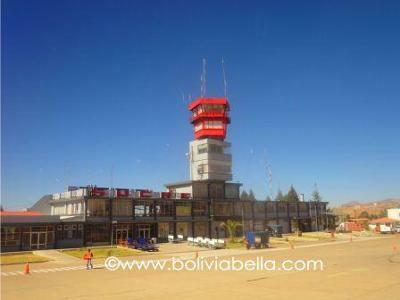 The government expects it will take about three years to build the new airport and intends to invest over 380 million bolivianos (about 54 million dollars) to build it. Morales also spoke of possibly constructing another airport in Monteagudo, also in the state of Chuquisaca, although this would need congressional approval. Does the Sucre airport have radar yet? )That would eliminate alot of the delays.) If not, is there any word on when it might be installed? Also, is the bus trip from Santa Cruz to Sucre still the worst in Latin America -- or have they paved some of it?